I had a problem with a friend's website a while ago. He asked me to review some documents and make any suggestions I might have. But when I tried to download the PDFs, Adobe killed my Firefox session. Up to then, Firefox had been much more reliable than Explorer, which has a bug that makes it frequently fail when you are using a dot.net site. Thank you, Microsoft. Once again, releasing a product expecting customers to be your testers. Would you like to go up in an airplane that was released that way? Anyway, I had had no trouble with PDFs up to then, and could easily download some of them from the same site, so I contacted my friend. He told me that my problem was probably that I wasn't using the 8.0 version of Adobe reader. That was correct. I'm always a bit wary of downloading a new version of anything. I wasn't even consciously aware that there was a new version. Thus I treated my friend to a little essay on backwards compatibility. Users are likely to be a version or two behind the latest. So if you used the latest version of Adobe (when did they stop calling it Acrobat? ), if it was not developed to work for users of the previous version, your users could have problems. True, it's Adobe's fault if they didn't design their software to create documents readable by their previous version, but it's your choice that shoots you in the foot. Your customer just gets frustrated and goes away or goes to the trouble to tell you. Your customer doesn't think,"Oh, I need to update a piece of software. I'll just go and do that right now." The documents didn't even display a message that it was Adobe's incompatibility - they left my friend holding the bag. Anyone who's now stuck with Microsoft Vista on their new computer has the same problem. Most things don't work and you're forced to replace a bunch of software. My understanding is that Apple's latest operating system release, Leopard, pretty much works with anything you're likely to own. I'm just waiting for that new MacBook Air to show up - a 3-lb laptop! An innovative change to its design -- it remains to be seen if their assumption is true -- but they eliminated the optical drive. Their assumption is that you will download all the movies and programs you need wirelessly. If you absolutely need to use an optical drive for something, it is designed to communicate with your other computers so you can tap into their drives. Note how our world has changed -- of course you have other computers! Your house and office are probably cluttered with them. Now you can take satisfaction that your just-in-case behavior has paid off. I'm finding myself deferring on replacing my desktop and using my laptop for everything. It's still sitting in the basement, taking up space. But we've also got the laptop my husband keeps on the couch next to mine, and his desktop PC, plus the desktop before that, since he hasn't fully moved all his stuff because he has to deal with the Vista problem. Compatibility issues killed my old desktop. It was using Windows 1938, I think, so he tried installing a copy of his Windows Today (I don't know what version is what - do I have to remember all that to sound competent in the world?). What's the worst that can happen -- it won't open and tells you to go back to what you have clear rights to use? No - it won't open and effectively kills your computer. I know there must be some clever way to get into DOS and save it, but how? Don't bother telling me -- I never trusted Microsoft so I backed up everything I could. More compatibility - my thumb drive and my desktop PC didn't want to talk to each other, so I had to use the CD drive to make disks. I figured I could reinstall any legal programs from disks. But I never bothered, just put everything on the laptop. The PC had reached the age where it sort of churned around aimlessly when I asked it to do anything. What's that all about? Was the product lifecycle designed to move along to the absent-minded grandpa stage? All these computer and software designers think they're pretty clever. It's more work and takes more research to figure out how old and new versions of things can live together peacefully. So why not make up the excuse that it will cause users to upgrade everything just like you want them to? That's a process that they like to spend their time doing anyway. But I consider that attitude grave disrespect for my time and needs. Makes me mad. It's also a violation of lean principles to change a process that will propagate likely interruptions and defects all over the system, assuming that people elsewhere in the system will just cheerfully and magically overcome them. And without holistic and global systems thinking, that's just what's going to happen. It's more work to examine the larger impact of changes you make to your node of the system. You may think that your design project is less lean because it will take longer, but you have to do it anyway. Isn't Japanese culture known for taking a long time to consider a large-scale change, but much quicker for people to make the change when the decision comes down? Hey - if you design software, electronic hardware, or measuring cups (notice how they all use ounce/cup markings? ), give your customer a break. Let them make changes when they are ready. It's not like you have to make concessions to someone using an old DOS computer, but have some mercy on the rest of us. Maybe we're resisting change for a reason - like that new stuff like Explorer causes us grief when it embodies disrespect for our needs. If you’ve read “The Goal,” you may remember the part where the people have created enough capacity that they need to look at the next step, the constraint in the marketplace. This is where a lot of lean manufacturers are now, especially as the many markets are severely constrained. In “The Goal” the people go visit their customers, get a better view of how they work and think, and go back and improve their product. In the case of Tarter Gate in Casey County, KY, the marketplace constraint was growing competition from Asia for their tube-formed livestock enclosures and related products. That prospect put the handwriting on the wall for the Tarter family. It wasn’t just their company at stake. Casey County is a rural area and there aren’t many opportunities for local people to find other jobs. An Osh Kosh B’Gosh apparel factory had already closed. The Tarter family had lived and farmed there for generations, and hundreds of employees and their families – their neighbors – would lose the income that fed and clothed their families if Tarter Gate failed. Though they didn’t start by calling it “lean,” the company had been focused on continuous improvement for some time. Their retail customers aren’t required to order truckload quantities as they are by other companies, and can count on 7-10 days lead time. The products themselves are high-quality and well-suited to the needs of farmers – the Tarters still operate a cattle farm themselves. But none of that counts if you don’t get the orders. So the Tarter family engaged The Idea Farm, a marketing agency in nearby Danville (which founded by Daniel Boone, if you care to know), to find out what decision makers in the retail outlets consider when selecting merchandise for their stores. They found out that buyers and store managers didn’t see much difference between Tarter Gate and other manufacturers. Their customers weren’t coming in looking for Tarter products. That left the company vulnerable to price-based competition. The answer was to rename their products lines, in marketing lingo, “rebrand” them, to make them stand out to different types of farmers. Now the Kentucky Bluegrass horse breeders can choose innovative horse feeding baskets from the Tarter Equestrian World line. Keeps the hay from getting soggy and it’s easy to clean. (Don’t you just hate soggy hay?) The American Farmland 10-ft heavy-duty grain feeder is stackable and can also be easily joined to more units to create as long a trough as the farmer needs. 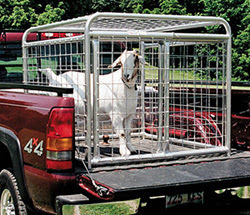 The Billy Goat Gruff Goat Gofer cage fits in the bed of a pickup truck and is designed to transport those “cunning escape artists.” Customers are also using the Gofers to transport dogs and game. (Hmm…maybe it’s a way to control those two black Labs that are chewing the furniture when you’re not home. They looked so cute when they were puppies, didn’t they?) Terrain Tough/Hunter’s Specialties are also helping to capture customers. Tarter Gate took home the 2006 Manufacturer of the Year by the Kentucky Association of Manufacturers. They are sponsoring a Kentucky Farm Bureau Excellence in Agriculture program that helps young farmers improve livestock genetics, facilities and production systems. Tarter also was named 2006 Vendor of the Year by the Do it Best Corporation. Jay Brown, VP of merchandising for Do it Best, said that Tarter Gate helps member stores stay profitable and never stops looking for new ways to provide products and services that help member stores set themselves apart from their competition. Sounds like customer focus to me. Tarter Gate’s success and renewal has special meaning for me. Although my great-grandfather moved on from Casey County, our family was among the original settlers in 1796 and founders of Casey County a few years later. My family helped build some of the roads the Tarters and their employees may use today. My grandfather’s grandfather served in the War Between the States alongside Tarter family members. My grandfather spent his summers on his granddad’s Casey County place, and never lost his ties to the area. It wouldn’t surprise me to have some third- or fourth-cousins among the workers in the plant. That the Tarter family stayed on in Casey County and became a mainstay of the community is good news. Thanks, guys. Physicians take the Hippocratic oath, which starts with the promise to do no harm in the course of performing their work. While lean practitioners are becoming increasingly aware of the principle of “respect for people,” changes made to improve processes and productivity can introduce hazards no one is aware of at the time. In an extreme case, a footwear manufacturer in China made changes at a 13,000-worker sports shoe factory in northern Guangdong Province that yielded faster order-to-delivery lead times, sometimes as fast as seven days, compared to 90-days in 2003. Work in process inventory was drastically reduced. Quality was improved. The factory began to produce more styles and change between them more quickly. Profits increased. In its traditional production process, work was performed in separate functional departments: cutting, punching, stitching, gluing, packaging and so on. Parts, then semi-finished assembled shoes, traveled from department to department for each stage of processing, sometimes moving from one floor to the next, with masses of work-in-process inventory in between. The change was made to small-lot process flow assembly cells. Skiving was being performed next to hot presses. While press operators were protected form heat and noise, the skiving machine operators were not. Adhesives and solvents were being sprayed or hand-applied immediately adjacent to workers operating sewing machines, exposing stitchers to chemical hazards that did not exist in an all-stitching department. Although there was some vapor capture and personal protective equipment provided to the adhesive workers, the stitchers had no such protection. Punch press and eyelet-installation machine operators were provided with hearing protection, but worked near stitchers and adhesive appliers, who had no protection from the noise. As the research team noted, exposure to hazards is easier to control when they are segregated in separate functional departments and separated by large distances in a plant. Reconfiguring workstations and product flow in the name of lean, locating all the assembly operations from cutting raw materials to boxing the final product in a manufacturing cell resulted in seriously degraded workplace health and safety. Perhaps the case only illustrates how easy it is to give lean manufacturing a bad name. While no one practicing “real lean” would tolerate such conditions, kaizen events can introduce safety hazards that participants don’t see. Because a proper kaizen team is cross-functional, including a safety professional should be standard procedure. When safety professionals have been part of the kaizen, resistance to their advice is reduced because they are not issuing "safety rules" from management. As long as they fully participate, everyone on the kaizen team can see the benefits of looking at productivity, quality, and safety as aspects of improvement that go together. Safety professionals gain a better understanding of the value-creating business of the company. Managers can be more confident that safety risk is being reduced, not increased. Some companies have unwisely eliminated staff safety positions, reassigning responsibilities to other overburdened managers and supervisors, or have curtailed opportunities for safety professionals to get training and to attend professional meetings and conferences. Managers need to recognize the importance of bringing safety knowledge into the firm. Not enough safety experts at your company? It may be time to begin training a cadre of engineers, maintenance workers and production employees to supplement safety professionals in this role on kaizen teams. This is a good answer to the “problem” of what to do as workers are freed up by productivity improvements. The foregoing is a draft of a short article I've written, but I'm not satisfied with it due to my shortage of first-hand experience in the field. I'm hoping that some of you smart visitors will add or comment. I will attribute all comments to their authors. I'm happy for LEI that they have an anniversary, and perhaps no one is more influential than they are. Their collection of observations from the community is called "REFLECTIONS ON LEAN." Can I claim that I might have inspired or influenced the choice of the title? Probably not. LEI says: The monograph Reflections on Lean was created in honor of LEI’s 10th Anniversary in September of 2007. In an effort to “go to the Gemba” we asked members of our community to submit their answers to the question, “How has lean changed your life?” Stories from people practicing lean in their daily lives (the do-ers) are coupled throughout the book with complementary quotes from other noteworthy sources (the thinkers). By sharing with you the struggles and triumphs your peers have experienced, we hope this book will serve as motivation while applying lean to your own work. Discount Information: Purchase 1-9 copies for $10/each. Purchase 10+ copies and receive a 50% discount.